Fair Trade Blue Handblown Glass Tumbler Drinkware Set of 6, "Cobalt Classics"
You can find blown glass drinking glasses 'Cobalt Classics' (set of 6) by NOVICA Handblown Collection in tableware categories such as Backyard Barbeque Drinkware, Beach Cottage Drinkware, Eco-Friendly Drinkware, Handblown Drinkware, Glass Drinkware, Tumbler Glasses Drinkware and Water Glasses Drinkware. Enjoy exploring these sections for other Novica treasures. "Best glasses I've ever owned"
I have been purchased a number pf similar of products from this Mexican artist, & just love the design & color scheme, the solid weight, the hand-blown technique & the artistry of Javier & Efren's collection. I've received many compliments from friends & family, & the evolving product line. My favorite artisan from Novica. Highly recommended. These glasses are elegant and also sturdy enough for everyday use. I bought a second set! I love using these for my summer margarita parties. They are well made and beautiful. Just the right size for iced tea or water, these glasses look beautiful and feel substantial. These glasses exceeded my expectations! The quality was supurb, the service excellent, the delivery prompt and secure. Novica was a please to do business with! 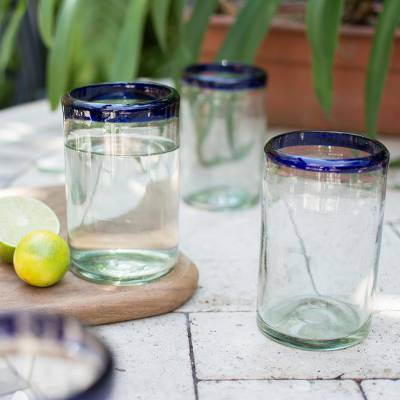 Perfect for Bloody Marys, Pina Coladas and others - even water! "Excellent gift, very high quality"
We're very pleased with these glasses, they're just the right size, and are very high quality. Each one is clearly uniquely made, but all are equally high in quality. Feels like a very good value for the money. Highly recommended! These are similar in appearance to those I have seen in chain import shops, but the quality is much better. I bought a second set. "Lovely set of margarita glasses!" I ordered these for my husband for Christmas. He enjoys making homemade margaritas and has wanted some authentic glasses for that. The ones we found on our honeymoon in Mexico were the traditional shape and way too big. These are much more fitting for what we need. Still a bit big, but they are beautiful. Thanks! Was very pleased with my glasses. Very nice and well made. I have been looking for glassware like this for a long time as I have pieces like it that I purchased years ago and wanted to add to them. These glasses are not only what I was expecting, but are even better. The colour and the quality of the glass are both perfect. I will be looking to deal with this artist again in the future. Thanks so much. These are well made and gorgeous! I intend to use them to hold flowers for a party I am planning. These glasses are the right size and weight, they look very pretty and will add beauty to your table settings. "A Fifty year search fulfilled!" I have admired this style of classic hand blown water glasses for over fifty years. When I saw the combination of National Geographic association, authentic artist production and fair price, I jumped on the deal! The glasses arrived a day before promised and exactly as described. I'm thrilled with my purchase. Beautiful and sturdy. Thick glass with a cobalt blue rim. We will be using these glasses for years to come! These are beautifully made and I use them every day! Handblown glasses with a cobalt rim. We had a set but they slowly dwindled down over the years. Impossible to find the same ones in Australia, was pleasantly surprised to find these again. Just like the original. Glad to have them back! Beautiful glasses. We love them, and the great service. Nice touch to add a personal card by artisan and history of Novica. We'll look forward to more shopping on this site. Love these. Please bring back! Absolutely the BEST glassware EVER!!! Many THANKS to Carlos & Novica ... what a GREAT philosophy ... makes one feel good shopping with Novica. These are the only gasses I've found that hold up to ever day use. They are very attractive, also. Each glass is unique to itself. Always have guests comment on how much they love them! Use them daily! I Bought 2 sets of these and a matching pitcher for my daughter. She loves them - they go right in the dishwasher, no special treatment required. They are not only pretty, they hold up to a family of 5 with 3 teenagers.